1901 Land Office Map of the Island of Hawaii, Hawaii. This rare and extraordinary 1901 map of the island of Hawaii was prepared for the 1906 Report of the Governor of the Territory of Hawaii to the Secretary of the Interior. Though the cartographic work that produced this map was started in 1878, during the Hawaiian Monarchy, the map itself, and the report that contained it, was issued following the U.S. Government's 1898 annexation of the Hawaiian Republic. The Report was an attempt to assess and examine the newly created Hawaiian Territory's potential for proper administration and development. Consequently the map focuses on Public Lands, Homestead Settlement Tracts, Grazing Lands, Pineapple Lands, Sugar Plantations, Forest Reserves, Forest Lands, Wet Lands, etc. It also features both practical and topographic details for use in administering the region. The governor at this time was George R. Carter. 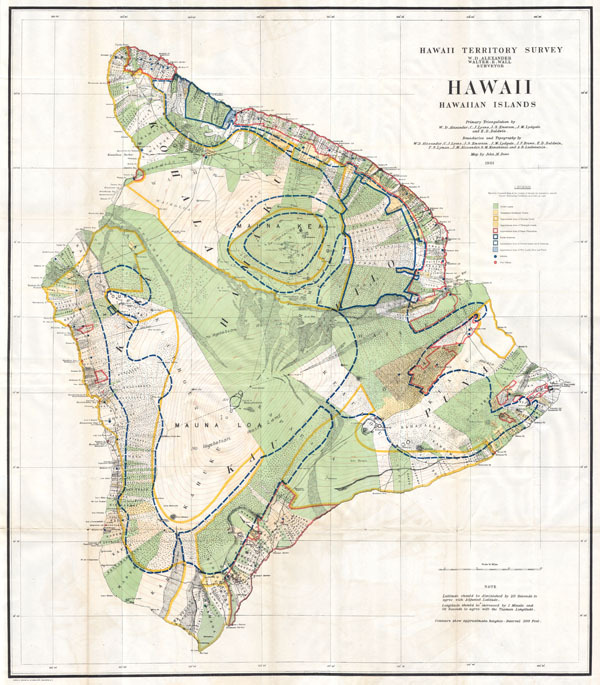 When it was made, this was among the most detailed and thorough maps of Hawaii ever made. The primary triangulation for this map was accomplished by W.D. Alexander, C.J. Lyons, J.S. Emerson, J.M. Lydgate and E.D. Baldwin. The boundaries and topography were the collective work of W.D. Alexander, C.J. Lyons, J.S. Emerson, J.M. Lydgate, J.F. Brown, E.D. Baldwin, F.S. Lyman, J.M. Alexander, S.M. Kanakanui and A.B. Loebenstein. The map itself was drawn by John M. Donn. William De Witt Alexander (1833 - 1913) was a Hawaiian born historian, publisher, writer, surveyor and teacher. Alexander was born in Honolulu in 1833 and received a degree from Yale University in 1855. After completing his studies Alexander returned to Hawaii where is taught Greek and history at the Punahou School. During this time Alexander published a number of books on Hawaiian history and ethnography. After nearly thirteen years in education Alexander accepted a commission with Royal Bureau of Government Survey. In this office Alexander did much of his most important work in mapping the Hawaiian Island. Eventually he attained the office of Surveyor-General of the Territory of Hawaii and a high position in the Privy Council of Kalakaua and Lili'uokalani. When Hawaii was annexed into the United States, Alexander assisted the United States Coast and Geodetic Survey in properly mapping the islands. Very Good condition. Minor offsetting and light discoloration on original folds. Else clean and beautiful.